The separation between the family and the servants, which is so easily managed in large country houses by extending over a large area, has to be secured by quite different means in the streets of great cities. It is only in very rare cases that ground is available for surface extension, and the necessary separation is obtained horizontally instead of vertically, and even then more or less imperfectly. As a general rule the principal entrance floor is raised somewhat above the street level, and is reached by a flight of steps which passes as a kind of bridge over a fairly wide area, which lies between the pavement and the house, and is utilised for lighting a series of lower basement rooms which are reserved for the kitchen and domestic offices. The servants therefore spend the daytime of their lives below the ground level, with practically no outlook to either back or front, while for sleeping they are generally banished to the top floor many storeys up; for the houses, being unable to extend laterally, are elongated upwards. It is not many years since moderate sized houses for the middle class were built upon this system, but of late they have given place to such houses as were described in the last chapter, or to flats, it being necessary under modern conditions of life to economise the service as much as possible. Servants dislike living in basements, and will not do so unless they are well paid, while a basement house crowded on to a small site, and many storeys in height, is necessarily an expensive one to work with its many stairs and great amount of carrying up and down. Fig. 7 shows a comparatively small house designed upon the basement system. External stairs on the pavement level lead down to the front area, a servants' w.c. and a coal cellar being contrived under the street pavement, so that the coals can be shot down through circular holes covered with coal plates. A so-called "back" entrance for tradesmen and servants, lighted by the staircase window, is obtained under the main entrance, and on the basement floor are found housekeeper's room (or servants' sitting-room) and a good kitchen, scullery, wine cellar and larder. There is a back area for light, and projecting below the garden level is a room for boots and brushes. There are both stairs and lifts to the ground floor, this providing easy service. In older houses of this description a lift was rarely provided, but it has become an acknowledged necessity now, and should be carried from the basement at least to the ground-floor level, and preferably higher; though it is intended as a rule to be worked by hand power, and so is only capable of carrying light articles. The dining-room occupies the space over the kitchen and scullery, while a small study is obtained above the housekeeper's room with its fireplace in the corner, there being also a corner fireplace in the hall. It is generally impossible in such a house to do otherwise than put the dining-room fireplace in the middle of the room, although this is acknowledged to be awkward and lacking in architectural possibilities, but something can be done with the hall and study. It will be noticed that a covered bridge, with windows on either side, leads across the back area to a lavatory and w.c, thus properly air-disconnected from the house. 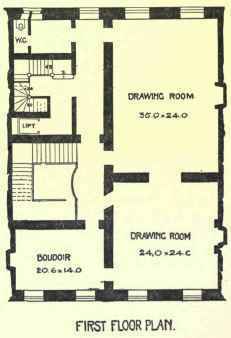 On the first floor is found the drawing-room, extending from back to front over the dining-room, and the principal bedroom with an adjoining dressing-room or bathroom, while on the upper floors, of which there may be two or three, there are three bedrooms each, together with w.c. It will be noticed that such a house provides ample accommodation-for a middle-class family requiring fairly good reception rooms, while being satisfied with a single staircase to serve all purposes. A house of a larger kind is shown in Fig. 8, planned for a considerable frontage, enabling entrance to be made on the ground floor to a large hall having a window recess opposite to a fireplace, round which the stairs wind. Such a hall is capable of handsome treatment, and can be used as a reception apartment when desired. 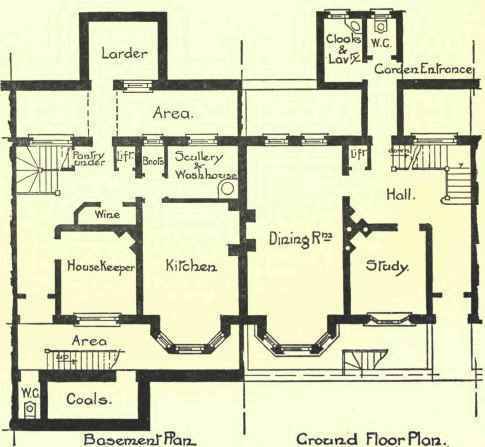 Out of this hall two large sitting-rooms are reached, one for use as a dining-room in the rear, and the other for a library at the front, while the servants' stairs are separately planned and well lighted, with a lift occupying the well-hole and passing right up the house. Cloakroom accommodation is obtained through a door underneath the staircase. On the basement floor the kitchen is underneath the dining-room, and it has been possible to provide also a housekeeper's room, butler's room, and servants' hall, together with wine cellars and butler's pantry, while larders and scullery extend at the back under part of the garden. The whole of the kitchen arrangements are thus upon a sufficiently sumptuous scale for the accommodation of a considerable number of servants, while communication is easily obtained both by a lift and staircase. The first floor is given over to a large reception landing, and to a boudoir and drawing-room separated by folding doors, so that they can be thrown together when desired. The principal staircase rises no farther than the first floor, the bedrooms all being served by the servants' stairs. This seems to be a somewhat ignominious arrangement, but it is usual in large town houses. Somewhat similar in its general ideas, but very clever in its arrangement, is the house in Berkeley Square designed by Messrs. Ernest George & Peto, shown in Fig. 9, for the comparatively narrow frontage of 40 feet. A small entrance hall or lobby, with a separate staircase to the basement for the use of the footmen, leads into a large hall, the light to which is obtained from above the staircase, which in this instance goes right up the house. The hall is separated into two parts by an arcade, and would make a fine apartment. The library opens out in the front, and the dining-room behind, with a narrow passage leading beside the main staircase to the back staircase and servery, and beyond that to a business room. The passage is continued even farther to a series of stables at the back, with an intervening staircase leading up to a billiard-room, which is thus well separated from the rest of the house. Although it forms no part of the matter with which we are dealing in this Volume, the clever planning of the stable, which opens on a back street, is noticeable. Six stalls and a loose box with cleaning-room, harness-room and coach-house are contrived in very little space, with a small house for a coachman and his family over the portion which faces the back street. On the first floor of the main building two drawing-rooms are arranged with connecting doors, but separate entrances for large reception purposes, while a small octagonal boudoir occupies the space above the servery and business room. A House In Charles Street-Berkeley Square. 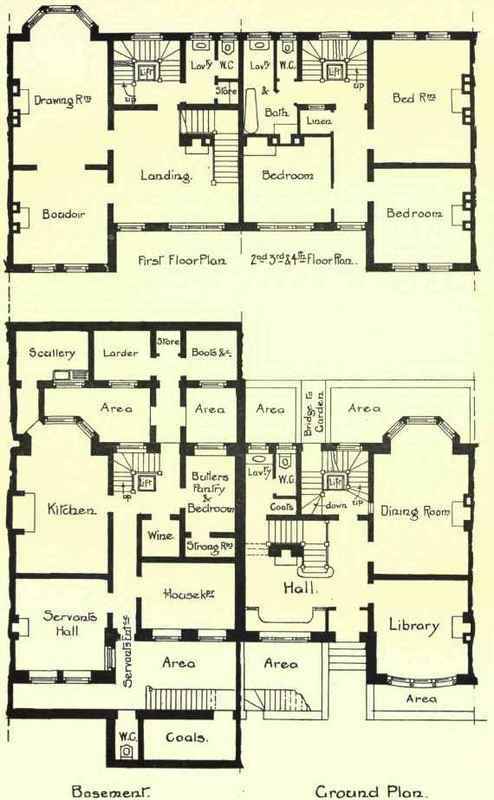 W.
The same architects have produced a larger house in Charles Street, as shown in Fig. 10, for a somewhat larger frontage. The entrance hall is here distinct from the staircase hall, out of which the library and dining-room are reached, the former in the front and the latter at the back; and these have communicating doors. The lift is placed between the main staircase and that reserved for servants, while the servery, lighted from a back area, has a sink and a small lift from the still-room. A bridge across the back area leads to a morning-room of apparently irregular but really symmetrical shape, capable of good architectural treatment. In the basement the butler's room and housekeeper's room are in the front, and the butler's pantry with its plate-room and the still-room at the back, all the unlit middle portion being occupied by wine cellars and a strong room for deeds. The coals are as usual stored underneath the street pavement, and are carried up the house by a large service lift. A servants' hall and maids' sitting-room are obtained underneath the garden, being lighted from areas, as are also the larder and scullery, while the kitchen is in the extreme rear underneath the stables. On the first floor there are two large communicating drawing-rooms and a boudoir. The main staircase ends here, an area being formed above it so that it may be top lighted, and that side-lighted communication may be obtained to the various bedrooms, which are reached by a secondary staircase which is carried over the servants' staircase, but not in absolute continuation of it. A house of this sort contains comparatively little sleeping accommodation, and is obviously intended to a large extent to be used for reception purposes, for which it is admirably suited. 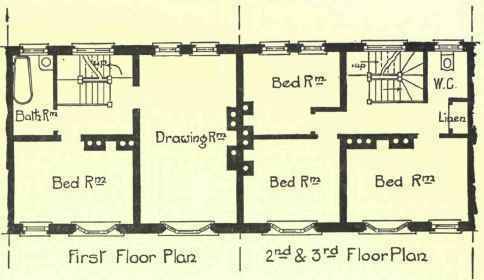 If many bedrooms are to be provided there must be several upper floors, and in spite of the lift the house then becomes difficult to work; and in any case communication with the kitchens can only be managed by means of speaking-tubes or telephone. It will be noticed that all the principal apartments are planned symmetrically. There is no attempt to obtain cosy nooks or recesses, but a grander architectural effect is aimed at than these can provide. This it is possible to obtain without loss of comfort where the rooms are large. In good houses like this there is little draught. The door and window openings bear a comparatively small proportion to the floor area, and are distant both from one another and from the fireplaces, which are themselves by no means cramped closely against the dining-tables or other furniture. Considerations of small points of comfort need not, therefore, outweigh those of architectural effect, and dignified and pleasing results are secured by tolerably simple means.